Home » Cancer » Vitamin C: Could It Help Treat Colorectal Cancer? Vitamin C: Could It Help Treat Colorectal Cancer? With well over 93,000 new cases each year, colorectal cancer is the third most common type of cancer in the United States. But did you know that something as simple as a common vitamin could help curb those numbers? Stick with me and I’ll tell you more. 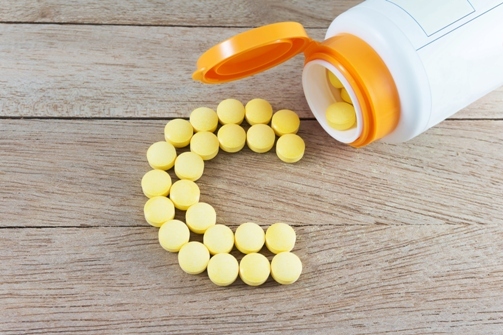 Could Vitamin C Treat Colorectal Cancer? A new discovery has been made that might save the lives of people who’ve been diagnosed with colorectal cancer. And surprisingly, it’s not from some new medication, but something that your parents likely gave you when you were sick as a child: vitamin C.
Now hold on for a minute; rushing to the grocery store to buy all the grapefruit, oranges, and bell peppers you can find won’t help you. In fact, the dosage you’ll need is so high you’d have to eat about 300 grapefruits to get these potential benefits. But I’ll explain why vitamin C still has so much potential. Colorectal cancer is very difficult to treat, because about half of all cases involve mutations of two specific genes: KRAS and BRAF. When these genes mutate, they tend to spread more aggressively and do not respond to current therapies or chemo. What’s interesting about this latest finding is that it flips our current understanding of vitamin C on its head. Vitamin C is largely recognized for its antioxidant capabilities, since it helps protect cells from damage or mutation. However, in KRAS and BRAF cancer cells, high-volume doses of vitamin C actually caused oxidization to kill them. In other words, the vitamin C reversed its role by becoming an oxidizing agent to virtually drown out the cancer cells! KRAS and BRAF mutations actually feed off antioxidants and need them to survive. However, the high doses of vitamin C can suffocate them, because it helps produce a compound called dehydroascorbic acid (DHA). When you absorb vitamin C, a fraction of it becomes oxidized and forms DHA (not to be confused with the healthy omega-3 docosahexaenoic acid). The antioxidants found in KRAS and BRAF mutations try to neutralize the oxidation, but aren’t up to the task and the cells are depleted. How Will this Vitamin C Cancer Treatment Work? Remember those 300 grapefruits I mentioned earlier? Because of how much vitamin C is needed to produce enough DHA to defeat the mutated cells, it is virtually impossible to consume it via oral supplements or food sources. Intravenous treatment, however, would be possible. At this stage, the research is still preliminary, but it does change our thinking as to how we might eventually treat certain cancers, like colorectal cancer, in a more natural and safer manner. This is definitely something I’ll be keeping an eye on! Yun, J., et al., “Vitamin C selectively kills KRAS and BRAF mutant colorectal cancer cells by targeting GAPDH,” Science, 2015; doi: 10.1126/science.aaa5004. Kaiser, J., “Vitamin C kills tumor cells with hard-to-treat mutation,” Science Magazine web site, November 5, 2015; http://news.sciencemag.org/chemistry/2015/11/vitamin-c-kills-tumor-cells-hard-treat-mutation.